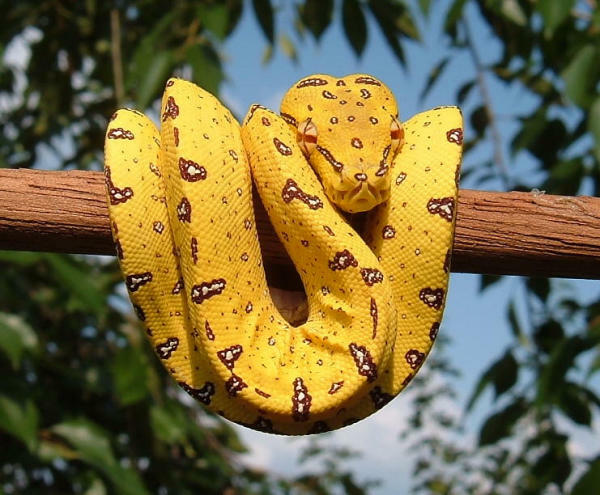 Morelia viridis, the green tree python, is a species of python found in New Guinea, islands in Indonesia, and Cape York Peninsula in Australia. A mostly arboreal species with a striking green or yellow color in adults. The color pattern on this species can vary dramatically from locality to locality. Adults average 3.9-6.6 ft in length, with a maximum growth (although rare) of about 7 feet. The supralabial scales have thermoreceptive pits. Here you may post messages or questions pertaining to all aspects and issues regarding the keeping, breeding, health, and conservation of Green Tree Pythons.